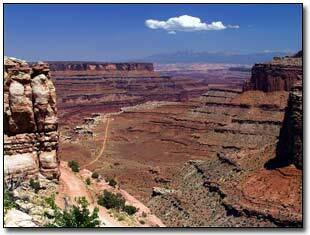 Canyonlands has 3 entirely different areas: The Needles, The Maze and The Island in the Sky. Each of the sections are entirely different. If you stay in Moab, try to get to the Moab Brewery. It's a lot of fun, a great microbrewery and exceptional nachos. On some nights it's $7.00 pitchers of beer and the Dead Horse Pale Ale is the best! Eddie McStiffs has great pizza and WiFi if you need to connect to the Internet. The Island in the Sky got its name from being a huge area of land with very steep drops of thousands of feet (as far as the eye can see). There is a 43' connector to this large piece of land and if the connector broke, you would have no way of getting off the land without being picked up by a helicopter. But there is no need to even worry about that. All the trails on top are extremely easy and many of them don't even need any water. Most of the trails are completely groomed or even paved and many of them you walk out, look down and walk back. It is a very beautiful area and great for photography. Be sure that you are in the right place at the right time based on sunset and sunrise. The White Rim walk has great views as well as Upheaval Dome. The crater is enormous (about 2 miles wide) and scientists still are not sure how it was created. The Mesa Arch is a great arch and is an easy walk to it. There are many photographic opportunities with the Mesa Arch. The Buck Canyon Overlook and the Green River Overlook are very picturesque. There are views of the Colorado River, the Green River and many other sights. If you have any extra time, don't pass up Dead Horse Park. It is a state park and there is an admission to enter. The panoramic view is breathtaking and it took about 300 million years to create. You will see an enormous view down along with the Colorado River. 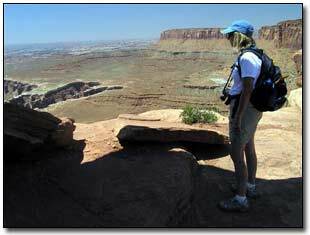 Hope you have a great time hiking Canyonlands National Park in the island in the sky section.